On February 1, 1881, driven by patriotic fervor and capitalized by over 100,000 mostly small investors, the French Compagnie Universelle du Canal Interocéanique began work on a canal that would cross the Colombian isthmus of Panama and unite the Atlantic and Pacific Oceans. Ferdinand de Lesseps, builder of the Suez Canal, led the project. His plan called for a sea-level canal to be dug along the path of the Panama Railroad. Some 50 miles in length, the canal would be less than half as long as the Suez. De Lesseps estimated that the job would cost about $132 million, and take 12 years to complete. Europeans had dreamed of a Central American canal as early as the 16th century; President Ulysses S. Grant sent seven expeditions to study the feasibility of such a work. As travel and trade in the Western hemisphere increased, the need for a canal grew increasingly more obvious. To sail from Atlantic to Pacific, ships navigated around Cape Horn, the treacherous southern extremity of South America. A New York to San Francisco journey measured some 13,000 miles and took months. A canal across Panama would save incalculable miles and man-hours. It would also, Ferdinand de Lesseps believed, make its stockholders rich, just as the Suez had done for its investors. Ample evidence supported de Lesseps' claims; the tiny cross-Panama railway had made in excess of $7 million in the first six years of operation. That construction of the railroad had cost upwards of 6,000 lives failed to dampen de Lesseps' enthusiasm. The French hacked a broad pathway through the jungle from coast to coast, and on January 20, 1882, commenced digging. They commanded an impressive array of modern equipment, from steam shovels and locomotives to tugboats and dredges. Their work crew consisted mostly of local black and Indian laborers. In the first months, the digging progressed slowly but steadily. Then the rains began. De Lesseps, who visited Panama once-during the dry season-had disregarded the warnings of men who knew Panama intimately. Now his crew discovered the real Panama-mile upon mile of impassable jungle, day upon day of torrential rain, insects, snakes, swamps, hellish heat, smallpox, malaria, yellow fever and the Chagres River. The Chagres snaked across the canal route a total of 14 times. Ignoring the warnings of engineers who deemed the task impossible, de Lesseps' decided to dam and divert the river, which he had only seen at low ebb. In the rainy season, the Chagres rose to a monstrous, churning torrent that swept away anything that stood in its way. It was distinctly inhospitable to taming. Chest deep in mud, the French force dug onward. Time and time again, the rain and the Chagres destroyed what engineering and hard labor had wrought. Mudslides buried men, supplies, and machines. And from the freshwater pools that lay everywhere, a deadly plague of insects rose. Ride through the Panama canal with this time-lapse video of the locks in action. In 1881, the French recorded about 60 deaths from disease. In 1882, the number doubled. The following year, 420 died. Malaria and yellow fever were the most common killers. Because the company often fired sick men to reduce medical costs, the numbers probably reflect low estimates. Believing the fumes from rotting vegetation caused the disease, doctors at the French hospital at Ancon advised workers to avoid the night air. Only after thousands of deaths would the cause be attributed to virus-carrying mosquitoes. Three out of four men hospitalized at Ancon died, despite the massive investments that made the hospital among the finest in the tropical world. In no small manner was this hastened by the architecture of the hospital gardens. To protect the potted plants from attack by ants, gardeners had set the pots in pottery bowls filled with water. Disease-carrying mosquitoes multiplied in these reservoirs by the million and carried their deadly cargo through the screenless windows of the hospital each night. Year after year, the digging-and the dying-continued. As the toll mounted, so did discontent. French investors grumbled at the lack of progress. In the page's of Harper's Weekly, American cartoonist Thomas Nast caricatured de Lesseps, wondering "Is M. de Lesseps a Canal Digger or a Grave Digger?" When the Compagnie Universelle du Canal Interocéanique failed in December,1888, thousands of French investors lost their money. The word Panama quickly became synonymous with scandal and fraud. About $287 million had been spent. Fifty million cubic meters of earth and rock had been moved. Eleven miles of canal had been dug. Twenty thousand men had died. The canal remained unfinished, but the dream had not yet ended. Theodore Roosevelt would soon take up the cause. Shortly after ascending to the presidency, Roosevelt spoke of the Panama Canal in a speech to Congress. "No single great material work which remains to be undertaken on this continent," Roosevelt said, "is as of such consequence to the American people." Roosevelt acted quickly. In 1902, the United States reached an agreement to buy rights to the French canal property and equipment for a sum not to exceed $40 million. The U.S. then began negotiating a Panama treaty with Colombia. The U.S Department of War would direct excavation. Many, both in the press and in the public, sensed a scandal, or, worse yet, good money thrown after bad. In the New York Journal, William Randolph Hearst opined that "the only way we could secure a satisfactory concession from Colombia would be to go down there, take the contending statesmen by the necks, and hold a batch of them in office long enough to get a contract in mind." Hearst's statement proved prophetic. When Colombia grew reticent in its negotiations, Roosevelt and Panamanian business interests collaborated on a revolution. The battle for Panama lasted only a few hours. Colombian soldiers in Colón were bribed $50 each to lay down their arms; the U.S.S. Nashville cruised off the Panamanian coast in a show of support. On November 3, 1903, the nation of Panama was born. The U.S quickly assumed parental interest. Americans had written the Panamanian Constitution in advance; the wife of pro-canal lobbyist Phillipe Bunau-Varilla had sewn the country's first flag. A payment of $10 million secured a canal zone and rights to build. Bunau-Varilla, installed as Panamanian minister to the U.S., signed a treaty favorable to American interests. The $40 million given to J.P Morgan for distribution to French stockholders disappeared amid rumors of larcenous speculation. 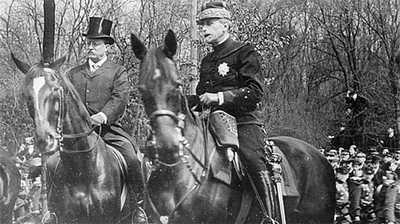 1904, the Americans' first year in Panama, mirrored the French disaster. The chief engineer, John Findlay Wallace, neglected to organize the effort or to develop an action plan. The food was putrid, the living conditions abysmal. Political red tape put a stranglehold on appropriations. Disease struck, and three out of four Americans booked passage home. Engineer Wallace soon followed. The Americans had poured $128 million into the swamps of Panama, to damned little effect. The arrival of Wallace's replacement, the rugged and ingenious John Stevens, marked a turn in fortunes for the beleaguered canal. Stevens had built the Great Northern Railroad across the Pacific Northwest. In rough territory from Canada to Mexico, he had proven his tenacity. And his new plan of action would ultimately save the canal. The kind of work that needed done, Steven reasoned, could only be done by a well-housed, well-fed, disease-free labor force. Stevens began work not by not digging, but by cleaning. Dr. William Gorgas, who had helped to eradicate yellow fever in Havana years before by killing the mosquitoes that carried it, directed sanitation efforts. Workers drained swamps, swept drainage ditches, paved roads and installed plumbing. 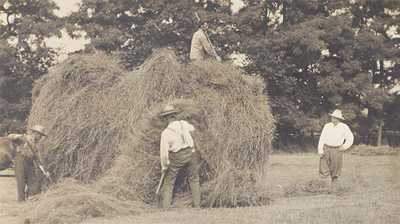 They sprayed pesticides by the ton. Entire towns rose from the jungle, complete with housing, schools, churches, commissaries, and social halls. The canal's engineering also changed. After nine months of Capitol Hill lobbying, the push for a "lake and lock" canal, favored by Roosevelt, succeeded. Stevens would dam the mighty Chagres to create the vast Gatun Lake in Panama's interior. A series of locks would raise ships from the Atlantic side to the level of the lake. The boats would cross the lake, then descend by another set of locks to the Pacific. Ironically, the plan was nearly identical to one proposed by the French engineer Godin de Lépinay in 1879, at the same meeting in which M. de Lesseps promoted his sea-level plan. With sanitation efforts complete, Stevens began work on a scale never before witnessed. Gigantic Bucyrus steam shovels scooped tons of earth. Railroad cars ran continuously on a double track, dumping the tailings to form the Charges dam. By December 1905, yellow fever had been officially eradicated on the Isthmus. 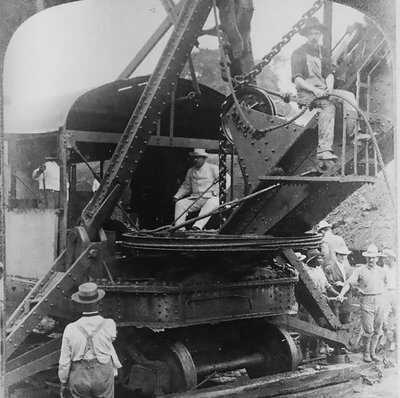 In November, 1906, Roosevelt himself visited the canal, posing at the controls of a Bucyrus shovel. It seemed that the project could not fail. Then, on February 12, 1907, a dispirited Chief Engineer Stevens resigned. Colonel George Washington Goethals, an Army engineer with experience building lock-type canals, assumed the Chief Engineer's post. Demanding and rigidly organized, Goethals quickly picked up where Stevens left off. Nowhere were efforts more dramatic than at the Culebra Cut, where 100,000,000 cubic yards of earth and rock would have to be removed. The laborers at Culebra -- mostly English-speaking West Indian blacks who made ten cents an hour -- moved as much as 200 trainloads of spoil a day. When mudslides filled the Cut repeatedly, Goethals simply ordered it dug out again. There were accidents of all sorts, lost equipment, and deaths, but there was progress. At the Gatun Locks on the Atlantic side, workers poured enough concrete to build a wall 8' wide, 12' high, and 133 miles long. They built culverts the size of railroad tunnels to channel water from Gatun Lake into the locks. Pittsburgh's furnaces roared as more than 50 mills, foundries, and machine shops churned out the rivets, bolts, nut, girders, and other steel pieces the canal builders needed. In May, 1913, steam shovels broke through the Culebra Cut, and the last cement was poured at the Gatun locks. The Chagres filled Gatun Lake, and engineers prepared for the canal's first trial run. It came on September 26. The tugboat Gatun traveled through the first set of locks and out onto the lake. The locks worked flawlessly. After nine years, the end was at last in sight. The Panama Canal opened officially on August 15, 1914. The world scarcely noticed. German troops were driving across Belgium toward Paris; the newspapers relegated Panama to their back pages. The greatest engineering project in the history of the world had been dwarfed by the totality of World War I.
Theodore Roosevelt came to the presidency intent on expanding U.S. power abroad and with a belief that America should be strong and ready to defend its interests around the world. 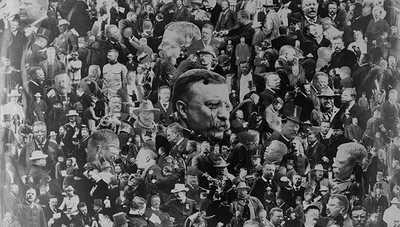 A selected chronology of major events during Theodore Roosevelt's time in office. Inquisitive and single-minded, TR pursued his interest in nature relentlessly — it was a pursuit that would impact America's wild places for decades after his death.